Are you unsure about securing your computer? Afraid you might wreck or lose something if you try? Confused by all the security products and what they do? Know you could be safer, but don't know what to do or where to start? Finally, here's a plain language manual you can understand! Written by a long-time technician and technology reviewer who specializes in explaining technical concepts in plain English, Protect Yourself Online offers the latest methods of securing your computer and information. Now you can quickly learn all the techniques that computer professionals spend years learning, without losing your data in the process. New computer users can easily grasp information security concepts. Experienced users will learn new tricks too. You'll want it kept next to your computer. Get your copy today. This entertaining little book will have you feeling like a security pro before you can ask, "What's an anti-virus program?" Includes easily understood definitions of common terms and abbreviations, and includes an appendix of additional information sources. 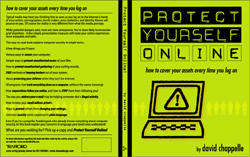 Protect Yourself Online: how to cover your assets every time you log on is the only Internet safety book you need.